Almost 19 years later, Glover is in a different and better place. He’s exchanged drugs and idle time that he readily admits led him to “criminal activity with a cocktail of crack cocaine, PCP, marijuana and alcohol” for mentorship and 12-hour-plus days with the construction company Miller & Long. There, he works in the human resources department. It’s the company where he started out as a carpenter’s helper in 2003, making $10 an hour. Nowadays, Glover faces a different set of challenges: helping other formerly incarcerated men build their own success stories. As an HR specialist at Miller & Long, Glover does everything from doling out advice to younger guys new to working in the belly of a construction site, known as the pit, to transporting workers to health clinics and drug rehabilitation programs. Of course, he recruits for the company as well. Glover also leads regular discussions during ex-offender forums hosted at Miller & Long headquarters in Bethesda, Maryland. During these sessions, returning citizens have an open forum to discuss work and life issues, and are offered resources to help them succeed on the job. 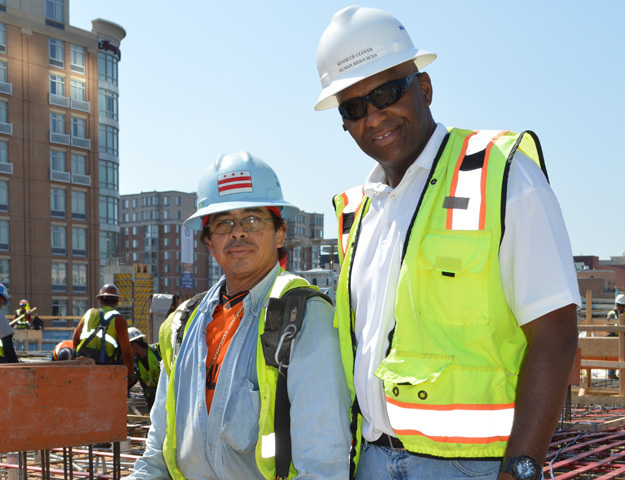 ON THE J-O-B Kenny Glover (right) on the job site with carpenter Rosario Bonilla at 601 Massachusetts Ave., NW in Washington, D.C. in June 2014. “As returning citizens, there are already roadblocks in your way. You gotta let other people help,” explains Glover. He knows the hurdles these men face, because as a two-time felon, he needed a network when he was released in 2002. For Glover, that started with the Rev. Donald Isaac, who headed the East of the River Clergy, Police, Community Partnership. “He gave me an opportunity,” says Glover, who worked for $6.25 an hour sweeping and cleaning up around the nonprofit’s office on First Street in Southeast Washington, D.C. When the grant money ran out, Glover says he had a chance encounter with John McMahon, chairman of Miller & Long. Soon thereafter, he started in construction.